Meet Duke! If you would like an expressive, wrinkle-faced guy who loves kids, cats, and female dogs (no male dogs), then Duke should fit the bill! He is a 5-year-old, 68-pound Mastiff/Boxer mix who is quite proud of the fact that he once lived successfully with a very nice pet rat. Previously Duke’s best friend was a 10-year-old girl, and he is quite the volunteer favorite! Leashed-walks and hanging out with his people are activities that feed his canine soul, along with smiling, belly rubs, cuddling, and baths! If you can provide Duke with a fenced yard, love, exercise, and a grain-free diet, then he would love to meet you and perhaps become your new best pal! 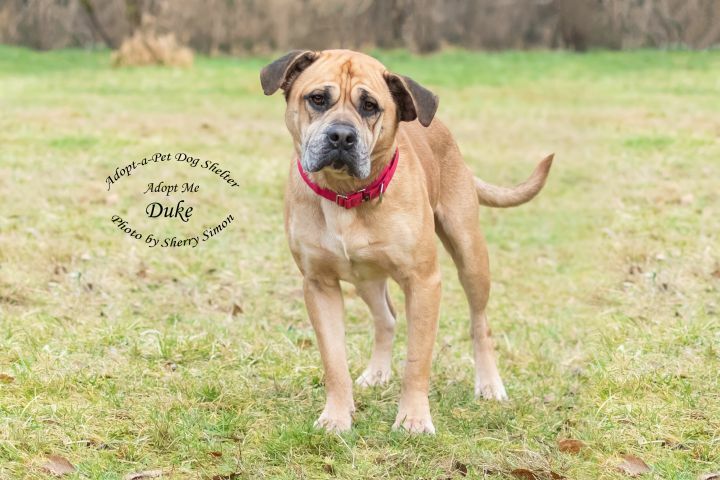 If you have further questions or would like to schedule an appointment to meet Duke in person, please contact the adoption team at Shelton Adopt-a-Pet. Emails are the preferred method of communication.